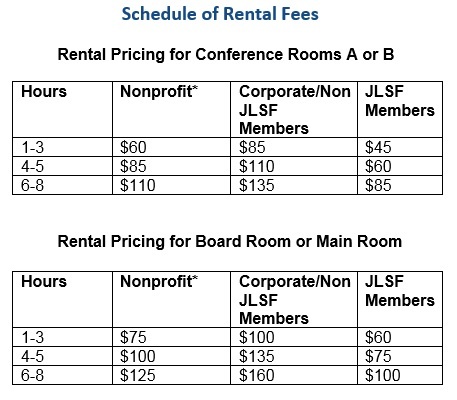 The Junior League of San Francisco Headquarters is available for room rentals Monday through Friday from 9:00 a.m. to 5:00 p.m.
A 10% discount is given with the rental of two rooms, 15% for three rooms and 20% for all four rooms. Please note that if you plan to have breakout sessions during our business hours, you must rent another room. Hallways/kitchen/doorways will not be available for this use. *Must provide documentation of nonprofit status when agreement is executed.